I’m a UCA student studying Digital Film and Screen Arts, and I’m a Youtube Partner. I’m currently making a film about giant fish in suits attempting to repossess my house. I’m not joking. I’m from a small village in a city called Peterborough, as for where I’m going…hopefully up, up is usually the way forward. Or is forward the way up? Shigeru Miyamoto is the bomb. I’m a big fan of the Scott Pilgrim graphic novels by Bryan Lee O’Malley. I can’t say I have a “grown up’s” book that guides my life. I’m not big on reading. I think I’m a bit dyslexic. Love: drawing, freedom, rice. Hate: wet socks. Scott Pilgrim…or maybe Batman. I’m not too big on super powers. I prefer average guys being badass. Nintendo World Store. I already know that and I’ve not even been yet. 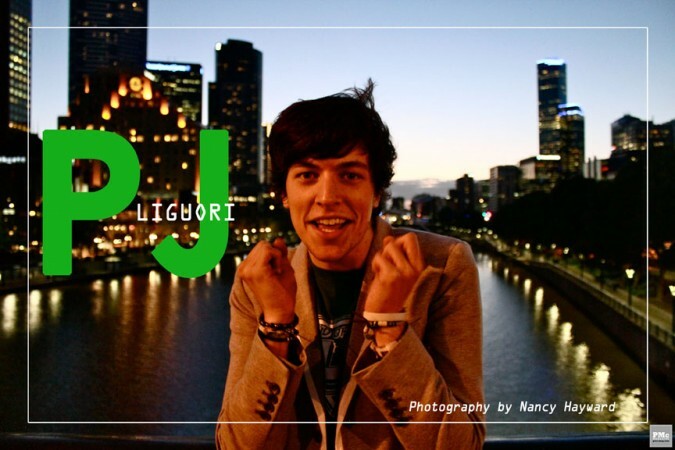 PJ Liguori does “internet”, as the cool kids might say. Companies send Liguori to different countries around the world to make videos, but he also makes videos for his subscribers on Youtube, tweets for his followers on Twitter, and drawings for his fans on Tumblr. Although he is known in some arenas as “KickThePJ”, only one person has come up to him in the streets and kicked him, and awkwardness ensued.